The United States Navy designed its first battleships with a single caliber of big guns before the British drafted the ship that gave its name to the Dreadnought Age. But the Americans missed their chance to name a whole naval and political movement after the USS South Carolina, completing her three years after HMS Dreadnought. As in other major navies, the Americans continued to add bigger and faster battleships with heavier armament. But in the years before the First World War, the fleet had a serious lack of cruisers to scout for the massive battle line. Many smaller nations that built dreadnoughts fell into the same problem, as they spent all their funds on the prestige ships and simply ignored the vital but mundane fleet units like cruisers, destroyers and support vessels. Argentina, Brazil and Chile launched impressive new battleships, but they comprised almost the entire fleet strength, with very little in the way of smaller warships or auxiliaries. The U.S. Navy did not exactly fit the pattern. The Americans spent heavily on facilities and less glamorous vessels, and built a series of destroyers culminating in the huge numbers of "flush deck" vessels launched during and immediately after the First World War. Where the fleet fell short was in its allotment of cruisers. The ultimate cruiser. Tennesee runs trials, 1906. By 1914, the fleet had the three small scout cruisers of the Chester class and the ten big armored cruisers of the Pennsylvania and Tennessee classes. A number of older cruisers were also available, well-suited for showing the flag in isolated ports or overthrowing the odd Latin American government, but not for modern naval warfare. Fleet cruisers needed to be able to scout ahead of the battle line, and provide gunnery support to destroyer flotillas. The Chester class was barely adequate to these tasks, but naval planners worried that they would be overwhelmed by heavier-armed enemy cruisers during the clash of light forces they believed would precede any fleet engagement. The big armored cruisers, in great favor with a number of American admirals, met the requirements for guns and armor. Built before the turbine revolution made greater speeds possible, they were faster than pre-dreadnought battleships but not the modern giants. They cost as much as a battleship when new, and various schemes to increase their engine power and speed persisted as late as 1929. Reluctant to part with them, the Navy retained the big ships for some years after the First World War as flagships. The obvious choice for future construction was a similar ship, with greater speed. One study looked at a fast armored cruiser armed with eight 10-inch/40-caliber guns, finding great favor in the 1906 report on future naval construction. A larger version, with 12-inch guns, was also suggested. In British practice, new battle cruiser designs followed the pattern of new battleships, with each class of dreadnought spawning a faster, more lightly armored analog. The 1908 report abandoned the 1906 concept of a more heavily-armed armored cruiser, suggesting that the U.S. Navy follow the Royal Navy's example with a 26-knot version of the Wyoming class battleships, then in the design stage for the 1910 Fiscal Year program. Wyoming shows off her broadside. The 1911 battle cruiser would have been a "stretched" version with four fewer guns. The Bureau of Construction and Repair handed in sketches the next year, showing a much lengthened Wyoming hull (670 feet for the new ship, against 554 for the battleship). The ship would have the same armor as Wyoming, and four twin turrets with 12-inch guns in place of the battleship's six turrets. Displacement would be 26,000 tons, the same as Wyoming. Asked for smaller alternatives, the designers came back with a ship that trimmed 20 feet off the length and 2,000 tons' displacement with three turrets and Wyoming-scale armor, or four turrets with the armor belt reduced by three inches. With approval thus channeled toward the 670-foot ship, construction seemed likely in the 1911 Fiscal Year program. But a number of developments combined to scuttle the project. 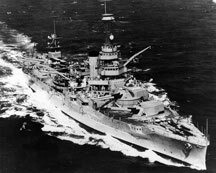 Wyoming herself had been a compromise design, much larger than the preceding Florida class but retaining the same 12-inch main battery as the first six American dreadnoughts. While the Americans were laying down Wyoming and her sister Arkansas with a dozen 12-inch guns, the British were beginning the Orion class super-dreadnoughts with ten 13.5-inch guns each. Concerned by this, President Theodore Roosevelt asked whether the United States should not also move to a higher caliber and build the next class with 14-inch guns. Alternative designs with eight and ten 14-inch guns were presented, slowing development of the battle cruiser design. The 12-inch Wyoming was selected for construction as the 14-inch gun had not yet been tested and the 14-inch designs were larger ships that could only be drydocked at Bremerton, Washington or at Pearl Harbor (a problem that also plagued the battle cruiser proposal). Roosevelt also faced another problem: Senate opposition to Navy appropriations, led by the virulent racist "Pitchfork Ben" Tillman of South Carolina. The Wyomings had been funded, and Roosevelt did not want to re-open the proceedings. The Senator's bitter hatred of black people — the Senator even publicly suggested a Holocaust-like eradication — led him to despise Roosevelt. Though less than enlightened by today's standards, Roosevelt had appointed an African-American postmaster for Charleston, South Carolina, and Tillman struck back against Roosevelt's beloved battleships whenever possible. As soon as the two Wyoming-class battleships were laid down, the Navy appears to have had buyer's remorse. The design with ten 14-inch guns was selected for the next year's battleships, New York and Texas. The two new battleships also reverted to reciprocating engines, as the Navy's General Board believed that the turbines fitted in the previous five ships would burn too much coal for a battleship to steam from the West Coast to the Philippines without coaling somewhere along the way. The battle cruiser could only make its designed speed with turbine power, but this power plant had temporarily fallen out of favor. The threat. HIJMS Kongo runs sea trials. Finally, details arrived of Japan's new battle cruiser Kongo, but in England at Vickers. Easily the best-designed battle cruiser built to date, Kongo carried eight 14-inch guns and had a top speed of 28 knots, though she was only slightly bigger than the American ship at 27,000 tons and 704 feet of length. She also had considerably less armor protection, but this was not evident at the time. Three sisters would be built in Japanese yards. Because of her relatively better protection, the Wyoming-variant battle cruiser does not suffer in comparison to Kongo as badly as it appeared at first glance. But the Navy could not justify going forward with a significantly inferior ship. The battle cruiser design would have to be re-cast with 14-inch guns, and eventually as battleship calibers increased to 16-inch guns. There would be no American battle cruiser. In the cardboard universe, we don't have to worry about human filth like Benjamin Tillman and can launch our paper projects. The Wyoming-analog battle cruisers, had they been approved, would have been built under the Fiscal Year 1911 appropriations and probably have been commissioned in late 1914. 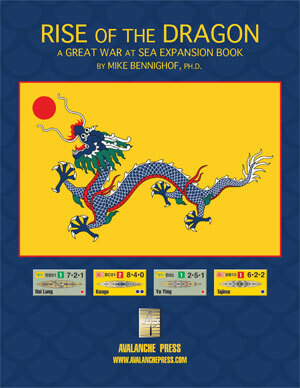 Two of them (likely all that would have been built) appear in Great War at Sea: Rise of the Dragon, where players can match them against the Kongo class and see if their better armor is a worthwhile trade-off against Japanese gun power.